Loved just catching up and connecting with people – so much of what I do is online or remote and it was just nice putting faces to names. Seeing the familiar and meeting up with new people – these F2F interactions cannot be underestimated. Lucy Bloom – putting on a daring, roaring, out there woman to start APLIC18 was a great idea – got me snorting at her birth story and Brazilians and made anything possible. Opeta Alefaio – I met Opeta in Fiji last October as part of the accreditation visit. We didn’t have a lot of free time, but made time to visit the National Archives of Fiji at Opeta’s urging/invitation. What fantastic stories and the impact of the archives is so powerful. When archives go out to communities – people connect, find out about their heritage, their past. Impact of outreach to build influence and credibility. Dave Snowden – the name rang a big bell, but it was only after I realised that David Snowden was big in knowledge management when I studied KM at uni in the early 2000s. I found you smart but annoying, dropping lots of ideas and theories into such a short amount of time – but I will watch your keynote again for the bits I need. His conference dinner reflection: the dance of the librarians. Slides from keynote and a TEDx (5 mins) to watch for later. Christine Mackenzie / INELI-Oceania. This was a late entry into the conference as a keynote pulled out a week prior, but really glad that this was included. It fit so well with the ALIA focus on SDGs, with publications such as Australian libraries support sustainable development goals. Libraries have the potential to have real impact on people’s lives, and expect more on this. This cannot be underestimated. And we do have a place in the Pacific. Michael Stephens. What an absolute joy and pleasure to see Michael in action with such an impassioned keynote to end the 3 days. I met Michael online many years ago he was probably one of the first library people I connected with online. 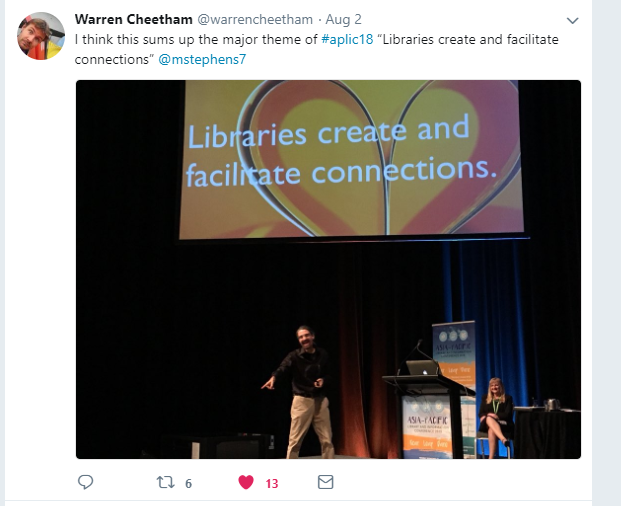 I took part in the Hyperlinked Library MOOC and when I found out that Michael would be speaking at APLIC I messaged him, asking him if he would come to Canberra…and he did! Carl and I spent a lovely day with Michael and his partner Steve, and we just connected. The best. What a gentle, thoughtful, inspirational person. A friend. 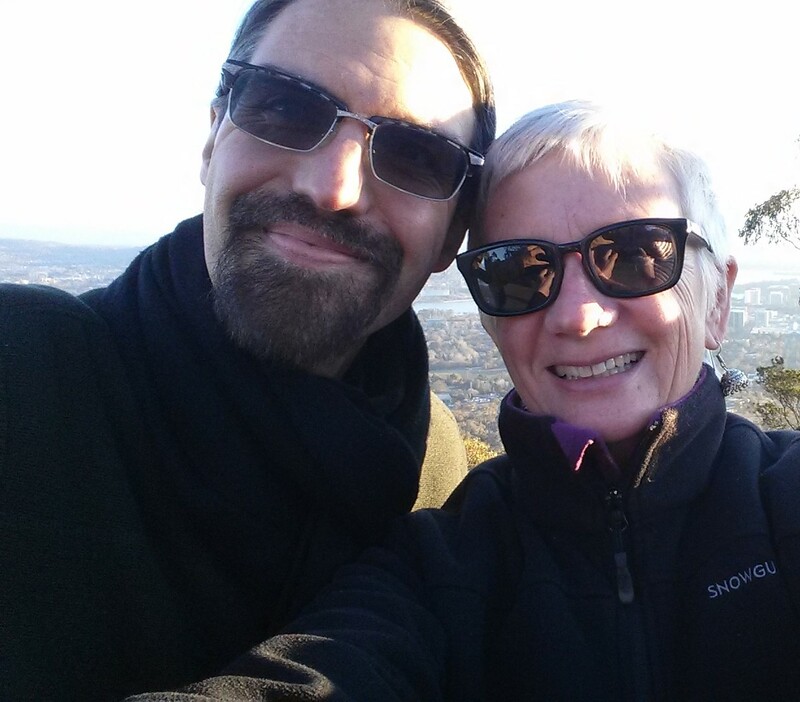 It was so lovely to meet up with Michael at APLIC18. Michael invited Carl and I to Michigan and we will come one day I know. But the joy was seeing Michael’s keynote, the slides don’t tell the whole story. 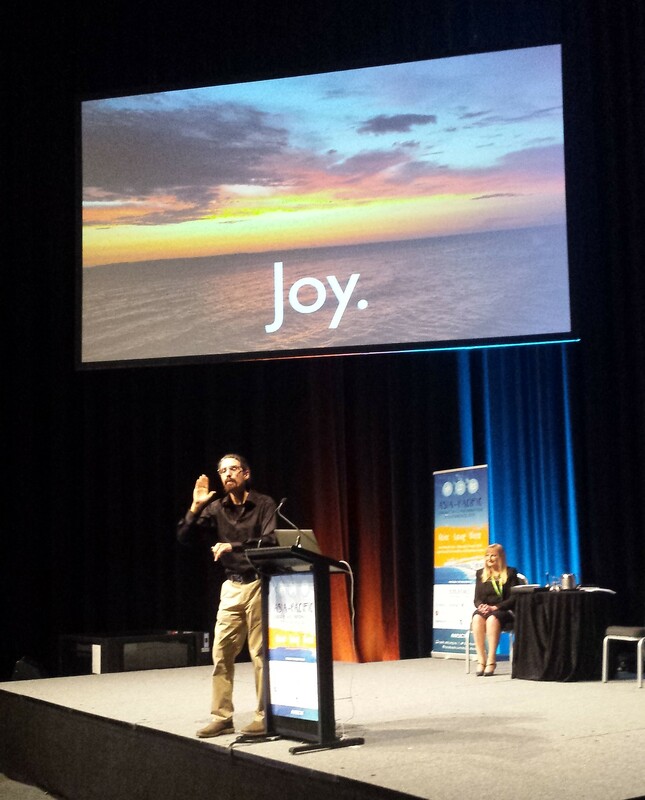 I loved Michael’s movement, his sudden realisation that he had a monitor to see his slides!…his humanity. This is my kind of stuff. Refective practice. Responsibilty. Open mindedness. Whole heartedness. Always learning. The heart of librarianship. We listen. We teach. We build community. We welcome everyone. We have the tech. We do the tech. But with heart. Lead from the heart. Learn from the heart and play from the heart. 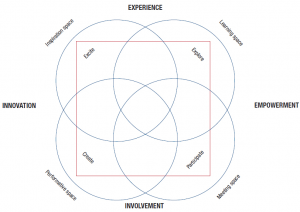 I also really thought the four spaces of the public library model that Michael referenced was so applicable and usable…the library for inspiration space, learning space, meeting space, performative space. And books. I loved the book stuff. 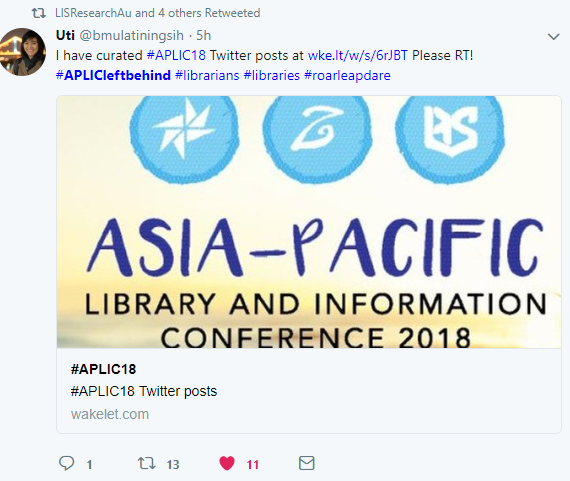 As a profession we often hear people say things like “oh you’re a librarian – it must be so nice sitting around and reading books/ being around books blah blah blah…” I didnt’ hear the author panel but followed on twitter, but I loved the author signings and the free books. How great to be at an event where there are books – great to have the publishers involved! I only left with two btw.